Over the last week, every time someone excitedly asks, “How was Africa?” I don’t know how to respond. There is no fast, small-talk response. “Amazing” pretty much covers it, but that word sounds trite and insincere. “Life changing” sounds clichéd, even though it’s completely true. On the other hand, “Malawi was wonderful and joyful and sad and informative and beautiful and heartbreaking and inspiring and frustrating and oh so much more” just doesn’t roll off the tongue quite like “amazing” or “life changing” does. As a writer and extrovert, I rarely find myself at a loss for words. But my thoughts and feelings about my trip to Malawi have rendered me speechless. While I struggle for a good response in daily conversation, there are a few things I always find myself mentioning in these far-too-short conversations. 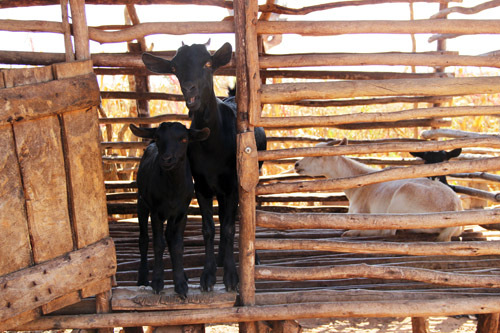 One of those things is that organizations like Heifer International are doing truly transformative work and it’s because of the way they do it that the work is making such a difference. You know that phrase, “Give a man to fish and he’ll eat for a day; Teach him how to fish and he’ll eat forever”? THAT is what Heifer (and many others) are doing. And it works. I’ve seen firsthand that it works. People are eating every day because of what they have been taught. Our first stop on the trip was at the home of the Mtika family. 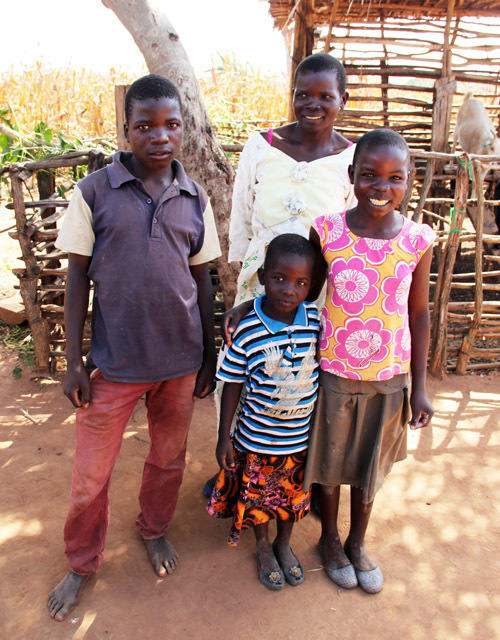 They live in a small village in the northern part of Malawi and have been working with Heifer for 4 years. 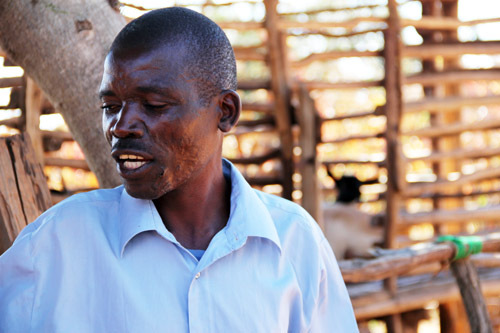 Mr. Mtika is a lead farmer, meaning he helps train others in his community with the skills he has acquired through Heifer. I learned so much from Mr. and Mrs. Mtika, both about life in Malawi and about how Heifer works. The thing that stood out most to me, however, was their gratitude for being able to feed their children. 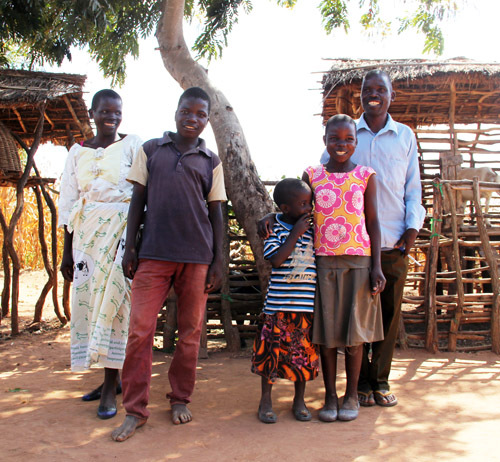 When asked how Heifer has changed their lives, they responded that their children no longer go to bed hungry. Here’s the thing about Malawi. Poverty is everywhere. Poverty is the rule, not the exception, and the scale is mindboggling. We learned that for a diet to be considered nutritionally balanced, the goal is to get 6 foods into the daily diet. 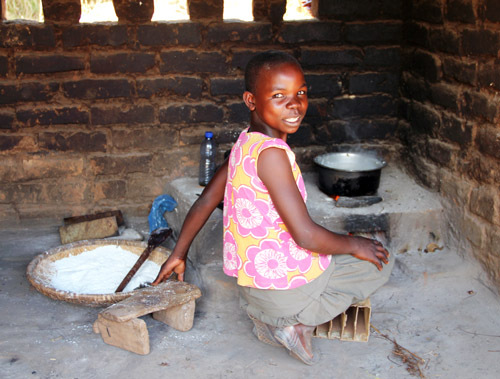 Malawians on average get only 4.3 foods. FOUR foods make up their ENTIRE diet. Even my most basic recipes have more than 4 ingredients. And, for that matter, the targeted 6 is still meager. These numbers were sobering to say the least. This is Rosie Bamoye, one of Mr. Mtika’s neighbors. She is fake cooking for the camera because she’s a good sport like that. These handmade ovens have improved the ability of these families to cook, including requiring 1/3 of the wood they used to need to cook. Rosie told us that she is herself transitioning from poverty to prosperity because of her goats that were passed on to her by Mr. Mtika. She has since passed goats on to others. As a food writer I was excited to try Malawian food. I learned quickly on our arrival that there really isn’t much traditional Malawian food to try. When people would find out I was a food writer they would excitedly ask, “Have you had nsima?” Nsima is a porridge-like food made with corn and water. That’s it. Corn. Water. For the duration of the trip I made sure to eat nsima at every meal where it was served. 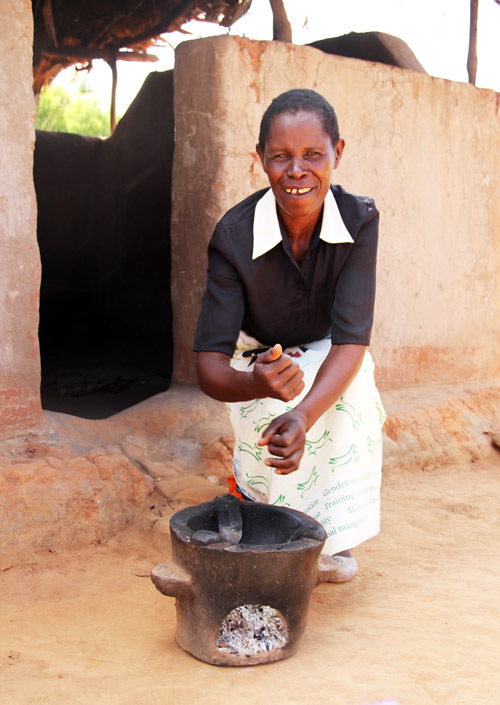 Dorothy Mtika (11) making nsima in the family’s improved kitchen space. Gin and tonics are especially popular in Malawi. But even that seemingly fun fact was in reality a sobering discovery – tonic water contains quinine, an antimalarial ingredient. 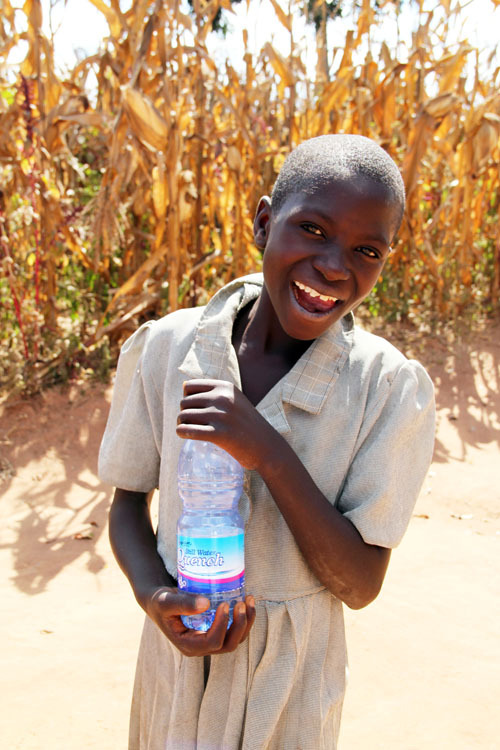 Bottom line: food and drink are quite simply about survival for most people in Malawi. While visiting the Mtika’s village, a little girl in a grey dress was walking alongside me for quite some time. She had a bright smile that was never ending. I finally stopped to ask if she wanted her picture taken, which she did. Funny enough she would never smile for the camera like she did in person, but she still loved looking at herself on the small camera screen. After the photo she asked me something that I could not understand. I grabbed one of our drivers, who was able to translate. “Do you have a water bottle I can have?” was her question. I did in fact have one and readily handed it over. The driver was curious as to why this is what she asked for, so he asked her why she wanted it. Oh, this sweet girl. My heart just about burst. The driver and I asked her if she would take one more photo, this time holding her bottle. After much prodding we were able to get this one, joyful, smiley shot. 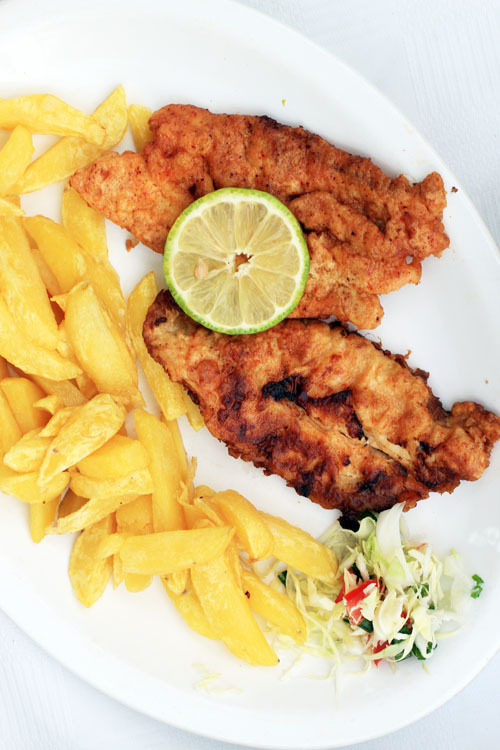 During our time in Malawi we did have delicious food, including fried chambo (a fish from Lake Malawi) and tons of Nali Peri-Peri sauce. 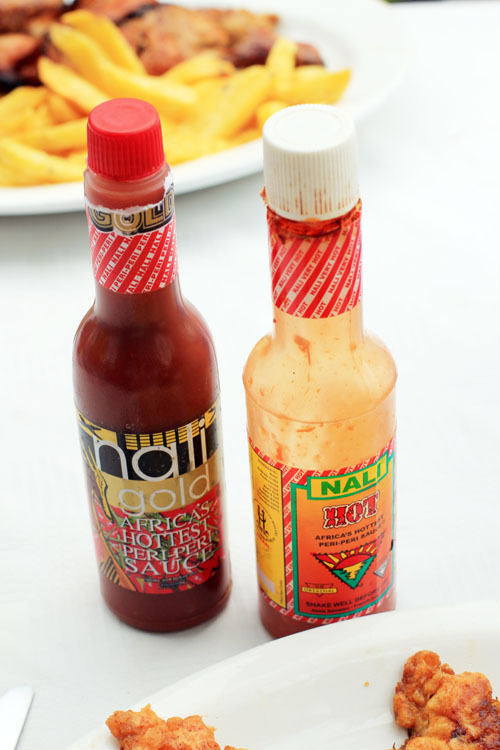 I actually came home with 6 bottles of Nali because, apparently, I am crazy for African hot sauce. Needless to say all that I observed and learned about food in Malawi has been constantly on my mind. It has certainly made me even more grateful than I already was for what I have. And I can honestly say that making my daughters’ lunches each morning has transformed from a chore to an honor. What a touching post, thanks for sharing! thank you, chelsea…and you’re welcome. and thank you for reading! Thank you for sharing this with us. Thank you for telling their stories AND your stories. you are so welcome. thank YOU for reading and caring! Wow, it must have been incredibly eye opening to be over there, meet families and learn about how they live. Thanks so much for sharing! beyond eye opening. I feel like I’m a pretty informed person and definitely empathetic…but there is nothing like meeting people in person and really seeing how things work first hand. it was amazing. This is great, Jane. The photos are gorgeous and the stories touching. I’m so glad you were able to go, thank you for sharing. This is absolutely wonderful to read! The children in my church need to hear/read what you have to say. We do a fundraiser for the Heifer Project each year. They children get so excited on what they are going to purchase to send to those in need. If it’s ok, I am going to share your story with our Director of Christian Ed. If you get out here during the school year, I would love to have you speak to the children about your experiences! I can’t wait to read the next post! What an amazing experience to share! Beautiful, touching photo’s and stories! I’m a huge fan of Heifer International—thanks for spreading the word so beautifully! This is heartbreaking and beautiful at the same time. Those smiles are contagious–they are obviously filled with so much joy despite having meager resources. That should speak to us all! 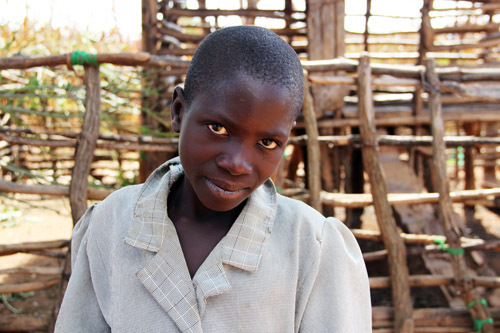 Thank You for bringing the plight of families in Malawi to the center of our attention. 4.3 foods a day! I will pray for this family and their community every time I reach into my fridge. Wow! Another beautiful post. We all have so much to be grateful for. Touching post. I love the before and after water bottle/girl in the gray dress photos. Her story definitely makes me pause and think. Truly, no words could possibly express what you have experienced in Malawi, Jane. Thank you for sharing these stories – it leaves us so much to grateful for and a realization that there is so much to be done. The girl in the grey dress has a smile that says it all. Such a wonderful post, Jane. Thank you for going there, writing this, and sharing these photographs.